While the iPhone SE rivals the iPhone 6s series in performance with the latest internal hardware, a new video reveals that the recently launched 4-inch smartphone is less durable than its larger 4.7-inch and 5.5-inch siblings when bent under pressure, submerged in water, and dropped on its corner. Extended warranty provider SquareTrade subjected the iPhone SE, iPhone 6s, and iPhone 6s Plus to a series of excessive bend, drop, tumble, and water tests, and the results show that its compact design does not necessarily make it more durable than the slimmer 4.7-inch and 5.5-inch iPhones. 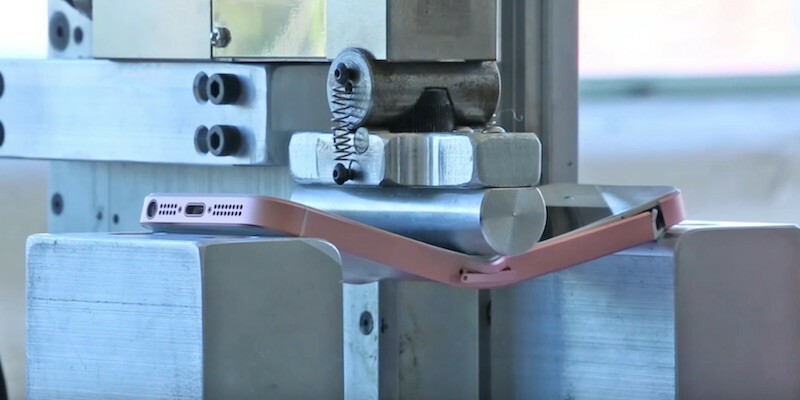 SquareTrade noted that the iPhone SE bent at 160 pounds of pressure, whereas the thinner iPhone 6s did not bend until an additional 10 pounds later. Moreover, at 178 pounds, the iPhone SE reached "catastrophic failure," whereas the iPhone 6s Plus was only beginning to bend under the pressure. When submerged under five feet of water, the iPhone SE permanently shut off after less than one minute. "In comparison, the iPhone 6s survived a full 30 minutes and only lost audio," said SquareTrade. "The iPhone 6s Plus started malfunctioning at 10 minutes and eventually died." One test where the iPhone SE, iPhone 6s, and iPhone 6s Plus all suffered the same fate was the facedown drop from six feet high, which shattered all three smartphone screens. But when dropped on its corner, the iPhone SE split along its side after ten drops, while the iPhone 6s and iPhone 6s Plus only had minor cosmetic damage. The results should be largely unsurprising given that the iPhone SE's design is virtually the same as the iPhone 5s, which yielded comparable results under similar tests over two years ago. The only cosmetic differences on the iPhone SE are matte chamfered edges and a color-matched inset Apple logo. But, there is video evidence to prove it. Surely the <cough>click-bait</cough> title should read: "iPhone SE found to be exactly the same as 5s in durability test" because it is a 5s with slightly different insides. The thing about testing the bend-resistance of the SE, is that the small form makes is far less likely to be effected by bending, certainly compared to either of the Plus models. Could it happen, sure, but it's not really a problem that people have been complaining about on the 5 or 5s (which are still being used in huge numbers). Finally, a good use for all those rose gold iPhones out there. dammit, and I was hoping to use this in an underwater hydraulic press! True enough, but the SE is really a sign of Apple's financial CEO deciding that its about money, not innovation. You want to know the new Apple then ask "why no new case?" Why did they not take the time to make the case stronger, more waterproof, and without the slot? All of which are technology they learned with newer phones. The answer is, 4 inch phone users were not worth it. Tell that to the millions of people who bought the SE this weekend. Personally, I am happy they did not change the design b.c I think the 5/5s is the best designed iPhone to date. SE is probably better than the 6. Although I'm sure it's not really an issue anymore. The 5S never had a bendgate issue. The 6 did, because it got bigger and thinner, but Apple didn't introduce higher quality aluminum, to counteract those changes. 6S was the solution.